Lilly Pulitzer Rousseau passed away on April 7, 2013. I've had great admiration for Lilly Pulitzer Rousseau. I truly value the organic evolution of her namesake fashion brand because she never dreamt of becoming a fashion designer but the clothing line was created in response to a need for uniforms for her juice stand in Palm Beach. Eventually, the juice stand uniform Shift dresses with bright floral prints became more popular than the juice. Upon learning about Lilly's passing, I was saddened but was quickly reminded with phone calls and text messages of why so many people loved her. People have an emotional connection to the distinct Lilly designs from which they associate cheerful memories. 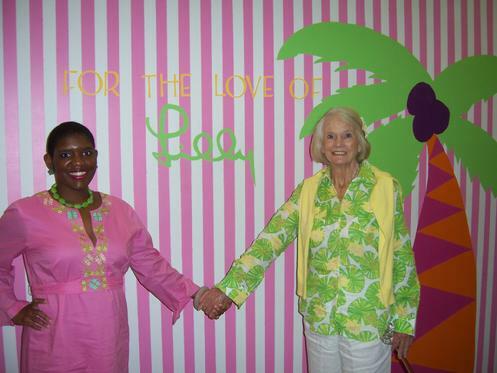 From August 2010 to February 2012, the non-profit Museum of Lifestyle & Fashion History (MLFH) presented the exhibit the Queen of Prep: Lilly Pulitzer Rousseau. As the curator of the exhibit, I performed in-depth research about the fashion brand that included traveling to Key West, Florida and interviewing the designers who worked for Key West Hand Print Fabrics which manufactured the trademarked Lilly prints. Ms. Rousseau also personally visited the exhibit and made a personal appearance for the 80th birthday brunch hosted for her in November 2011 at the Museum of Lifestyle & Fashion History. It was an honor to get to know her as a friend and we spoke on a regular basis. Due to the popularity of the Queen of Prep exhibit and because of the many donations of vintage Lilly designs and fabrics received by MLFH, we have been invited by a prestigious national museum to travel the Queen of Prep exhibit for a special display. Here is the link for the Museum's tribute blog about Lilly Pulitzer's passing that includes her bio and history of the Lilly company: Click here. Deepest sympathies to the Lilly Pulitzer Rousseau family. I am sorry that Lilly is gone. Visit the MLFH BlLOG for More Messages from Lori J. Durante, Executive Director/Chief Curator of the Museum of Lifestyle & Fashion History. You can also Subscribe to the Blog. The Museum of Lifestyle & Fashion History hosted a special celebration for Black History Month on February 17, 2011 when the MLFH conducted a private group history bus tour for the Retirees, Friends & Seniors Club which consists of retired African American professionals. This group of African American tourists was visiting from Broward and Dade Counties and they are retired doctors, lawyers, nurses, teachers and administrators. Their private tour also included viewing the exhibits at the Museum of Lifestyle & Fashion History located inside the Boynton Beach Mall in Boynton Beach. Complimentary coffee, pastries and lattes were sponsored by David Lerner & Associates. We had a sold-out tour of 55 people and there was a waiting list. The current exhibits which they viewed are Fashion Treasures, Barbie: History, Fashion & More celebrating Ken�s 50th Anniversary; and For the Love of LILLY which is about Lilly Pulitzer and her namesake fashions. <?xml:namespace prefix = o ns = "urn:schemas-microsoft-com:office:office" /> The Lilly Pulitzer fashions are strongly associated with the Preppy American who has been defined as being WASP. The Lilly fashions were introduced in year 1959 during the era of legal segregation. The Lilly company flourished with numerous boutique stores serving their Preppy American clientele. But, what I learned from the members of the African American Retirees Club is that some of them had parents who worked for the wealthy WASP families who lived or vacationed in Miami Beach so the Lilly Pulitzer fashions would get passed down to them from their parents who would get them from these wealthy families. To share some brief history, after the completion of Henry Flagler�s Railroad that was built along the east of Florida, tourism boomed that consisted of wealthy whites who came to the area seasonally from the northern States. These wealthy seasonal residents hired African Americans as their maids, butlers and chauffeurs. During this time of racial segregation, working for a wealthy white family was considered a very good job in pay and social standing. In many cases, those African American workers were then exposed to the same high-society of the white people whom they were serving. And, it was customary that when the white people whom they worked for discarded clothes (i.e. Lilly Pulitzer), home accessories and even luxury cars, they would give it to their loyal African American workers. The Retirees Club requested that their tour of the area be customized to include a visit to West Palm Beach, FL so arrangements were made for them visit the 1916 Courthouse Museum in West Palm Beach. After traveling to West Palm Beach, the tour headed back South to Delray Beach for the history bus tour. The Narrated Bus Tour of Historic Delray Beach traveled through five historic districts and neighborhoods that included Banker�s Row, West Settlers, Frog Alley and Downtown Delray Beach. The historic sites visited were the 1926 Sandoway House Nature Center, the 1926 Colony Hotel and St. Matthew�s Episcopal which is a historic Bahamian church. 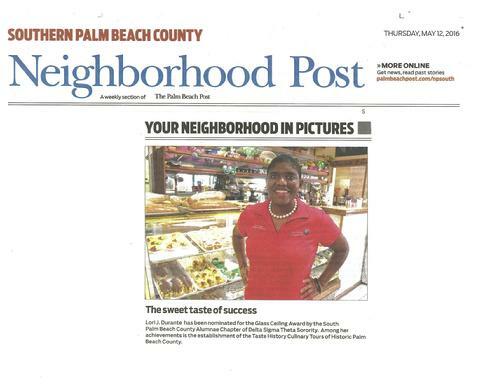 The MLFH tour of historic Delray Beach highlights the contributions of both the European and African American settlers to the area. This private tour concluded with a hearty buffet lunch at Donnie�s Southern Restaurant in Delray Beach. Many of the members of the group said that, prior to the bus tour, they didn�t realize how much Palm Beach County has to offer. The Retirees Club expressed interest in planning a possible return visit for the tour and including an overnight hotel stay. 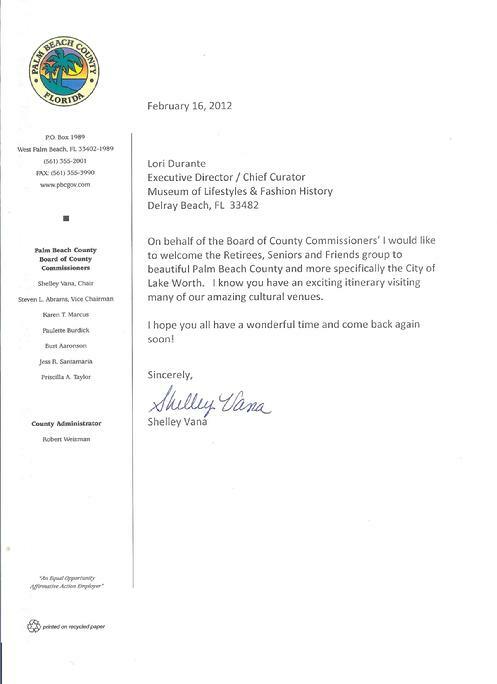 The February 17, 2011 tour was one of the largest groups of African American tourists to recently visit Palm Beach County, FL. For more information about the MLFH call 561-243-2662. Hope that you had a Happy Thanksgiving and wishing you a Merry Christmas! I send this greeting to you to share some of the Museum of Lifestyle & Fashion History's thankful experiences with its educational programming and exhibits. November is an extremely important time for the Museum of Lifestyle & Fashion History (MLFH) because it is the birthday month of some special people to MLFH. On November 12th, MLFH celebrated the 80th birthday of Palm Beach fashion doyenne Lilly Pulitzer Rousseau at The Preppy American Brunch hosted at MLFH. Lilly Pulitzer Rousseau was crowned the Queen of Prep because of the eponymous resort fashions she inspired in Palm Beach, Florida. The history of the iconic fashions, their appeal to Preppy Americans and the family heritage of Lilly are showcased at MLFH in the exhibit The Queen of Prep: Lilly Pulitzer Rousseau (formerly named For the Love of LILLY). Due to popular demand, The Queen of Prep exhibit has been extended for another year to November 2012. The Preppy American Brunch was a sold-out affair with more than 100 attendees traveling from various Southern States and from cities in the USA located all along the East Coast. You can check out photos from the event on the MLFH Blog. Click here. You can also subscribe to the MLFH Blog for future news. Please consider a tax-deductible donation for the continuation of the exhibit and the development of school field trip programs for children. Donations can be made on-line by clicking here. The late Boris & Edith Rueger, who were longtime supporters of MLFH, share back-to-back birthday dates on November 21st & 22nd. When the Ruegers passed they left a wonderful bequest for MLFH. The Ruegers are still remembered! They provided tremendous support for the MLFH educational events and permanent building efforts. To recognize their support, the Boris & Edith Rueger Fund was designated at MLFH and tax deductible donations to MLFH are still accepted in their honor. Click here to read about the Ruegers. November 5th marked the birthday of the late Patricia Ann Ravo. Patricia had a courageous fight with breast cancer to which she succumbed in year 2004. Because of an annual bequest that MLFH receives from the estate of Patricia, her legacy lives on and so do the various educational programs for the MLFH. Click to read more about Patty. The Patricia Ann Ravo Fund was established at MLFH and donations can be made to MLFH in honor of Patty. In just a few days in December 2011, MLFH will premiere SCAASI: An Iconic American Fashion Designer. The MLFH exhibit will open for a mini-display at Johnson & Wales University in Miami, Florida where the University will be honoring SCAASI with the Distinguished Visiting Professor Award. Following the display at Johnson & Wales, the feature exhibit will be displayed at MLFH. The Palm Beach Daily News is the Print News Media Sponsor for the exhibit. Fred & Jean Sharf have pledged $15,000 to MLFH for the SCAASI exhibit. The support from Mr. & Mrs. Sharf has been a blessing. Efforts are being led to raise monies to match that contribution. Visit MLFHMUSEUM.org for more about the exhibit and information on how you can make a tax deductible donation. Monetary contributions can be made in any amount. Back in October, MLFH premiered its new program Taste History Culinary Tours of Historic Delray Beach & Boynton Beach, Florida. This new cultural culinary excursion consists of a bus riding and walking tour of historic districts with specific visits to restaurants located in historic buildings and/or historic districts. Guests on the tour learn Florida history, local facts, foodways and experience food culture with tastings at eateries and restaurants that are along the tour route. The first 7-months of the tours sold-out! Due to popular demand, more tour dates have been added. 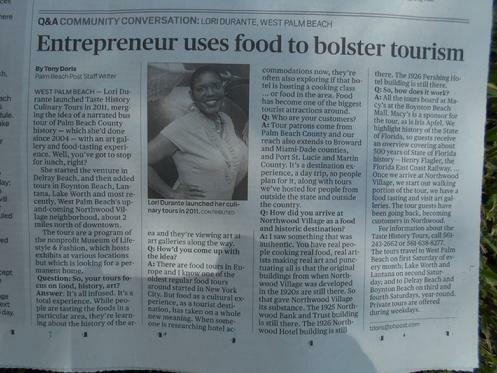 To accomplish making more dates available, the Narrated Bus Tours of Historic Delray Beach has been converted into the new Taste History Culinary tour program (effective December 17th). What this means is that the culinary tours are now available twice a month on the 3rd and 4th Saturdays of each month, year-round and the tours will include visits to restaurants and historic sites/buildings. Click here to read the Taste History Blog and see the pictures from the previous tours. You can also subscribe to this Blog to receive news about these food tours. Pre-paid reservations are required and can be made on-line at tastehistoryculinarytours.org. You can still take the regular Narrated Bus Tour of Historic Delray Beach on Saturday, November 26th but from thereafter it will be the new culinary program. Click here for the regular bus tour. Another fundraiser that is being held for the MLFH is at US 1 AC Self Storage in Boynton Beach, Florida. US 1 is very unique because it also has Wine Cellar Storage. For any MLFH supporter who rents space at US 1 that storage company will make a donation to MLFH. Click here for their website. Thank you much for your time, interest and support. The Museum of Lifestyle & Fashion History is a non-profit 501c3 organization as designated by the IRS. Donations are tax deductible and are greatly appreciated in any amount! Please support MLFH. Annual memberships to MLFH are also available. With so many economic challenges in the world there are still some thankful experiences at MLFH but we continue to need your support! You can also reach us by calling 561-243-2662. Group tours are offered. Please visit MLFH at its donated 8,000 square feet facility that is located at 801 N. Congress Avenue, Suite 483 inside the Boynton Beach Mall in Boynton Beach, Florida! The mall is owned by the Simon Property Group and they have made the donation possible for MLFH. On Saturday, June 25th, the Museum of Lifestyle & Fashion History at the Boynton Beach Mall had a special group tour/field trip visit from students in the new Summer Fashion Program at Lynn University of Boca Raton, Florida. The Lilly Pulitzer fashions are strongly associated with the Preppy American who has been defined as being WASP. The Lilly fashions were introduced in year 1959 during the era of legal segregation. The Lilly company flourished with numerous boutique stores serving their Preppy American clientele. To share some brief history, after the completion of Henry Flagler�s Railroad that was built along the east of Florida, tourism boomed that consisted of wealthy whites who came to the area seasonally from the northern States. These wealthy seasonal residents hired African Americans as their maids, butlers and chauffeurs. During this time of racial segregation, working for a wealthy white family was considered a very good job in pay and social standing. In many cases, those African American workers were then exposed to the same high-society that they were serving. And, it was customary that when the white people whom they worked for discarded clothes (i.e. Lilly Pulitzer), home accessories and even luxury cars, they would give it to their loyal African American workers. As you may know, the Museum of Lifestyle & Fashion History (MLFH) is moving forward with creative exhibits, enjoyable programs and memorable educational experiences. During Thanksgiving weekend, MLFH will be offering special programs. On Saturday, November 27th, the Museum will be conducting its Narrated Bus Tour of Historic Delray Beach, Florida. These historic tours have been rated The Most Unique Travel Gem by AAA Travel Magazine; and voted Best Tour of the Town by The Palm Beacher Magazine. The Museum opens at 10am on the day of the tour and complimentary lattes, coffees and pastries will be provided sponsored by David Lerner & Associates. Plus, visitors will be able to view the exhibits on display at MLFH prior to boarding the bus for the tour. Visit DelrayBeachBusTours.org for more information, e-mail: Tour@delrayBeachBusTours.org; or call: 561-243-2662. Discounted rates are available for members. Also, for Thanksgiving weekend on Sunday, November 28th at 12 noon to 4pm, the Museum of Lifestyle & Fashion History will be hosting a reception and book-signing for the famed author Lisa Birnbach who wrote the Official Preppy Handbook, and the book TRUE PREP: Its a Whole New Old World. The cost for attendance is regular museum admission which is $5.00 per person; $1 per child age 12 and under; and free for members and children under age 2. Barnes & Noble Booksellers will be on site at MLFH to sell copies of TRUE PREP which retails for $19.95. The book can make for a great gift for the holiday season. Please join us on November 28th at MLFH which is located inside the Boynton Beach Mall (near Sears) in Boynton Beach , FL. The event is being sponsored, in part, by The Colony Hotel & Cabana Club-Delray Beach and Toojays Gourmet Deli. The reception and book-signing for Lisa Birnbach is one of the special events being held for the MLFH For the Love of LILLY exhibit. This exhibit chronicles the evolution of the Lilly Pulitzer preppy fashions. The LILLY exhibit is multi-media featuring more than 80 vintage items including original Shift dresses, golf shirts for men, cocktail napkins and trays; along with the original Lilly fabric that was designed at Key West Hand Print Fabrics. Archival photos and news clippings are a part of the display too. The exhibit provides a historical, social and educational context about the Lilly Pulitzer fashions and their appeal to the Preppy American. Also, showcased in the exhibit are Lilly-inspired designs by students from Miami International University of Art & Design. School field trips are also available for the LILLY exhibit with a focus on Mathematics in Design & History for grades Pre-K thru 6th grade. And, history field trips are available for grades 7th thru 12th. The Lilly Pulitzer exhibit also connects to curriculum strands about Florida history and famous Floridians as the Lilly company was headquartered in the Town of Palm Beach, Florida; the fabrics were designed in Key West , Florida ; and the clothes were manufactured at the Lilly factory in Miami , Florida . To add, MLFH has an educational component about the history of the cotton fabric for the LILLY exhibit. The Lilly fashions were known for their use of cotton fabrics being that the designs were preppy resort wear. The educational cotton aspect includes its history and various uses. The non-profit organization Cotton, Inc. has provided to MLFH various educational resources and material for the school field trips for the LILLY exhibition. For more information, call: 561-243-2662 or e-mail: LillyExhibit@MLFHMUSEUM.org. Other exhibits being profiled at MLFH are Barbie: History, Fashions & More which features more than 100 Barbie dolls, friends, family members, clothes and accessories. Moreover, during the months of November, December & January, the Museum will feature a special display of holiday Barbie dolls and a Christmas tree decorated with Barbie ornaments. Also, on view is Fashion Treasures from the Museum’s Permanent Artifact & Fashion Collection which highlights more than 40 historic artifacts, clothes, accessories and household objects. Please visit the Membership or Donate page of this website to learn about the various ways that you can get involved with MLFH and help us to continue our educational mission. The phone number is 561-243-2662 or e-mail Info@MLFHMUSEM.org. About one-year ago, the MLFH opened in a donated 8,000 square feet facility located inside the Boynton Beach Mall in Boynton Beach , Florida . The facility was renovated to include three gallery spaces and an education room. Many people contributed various amounts to help raise monies for the renovations of the facility at the mall. And, amazing support also came from the Patricia Ann Ravo Fund as well as the Boris & Edith Rueger Fund. In addition, in-kind donations of paint and renovation supplies were received too. Although established in 1999, MLFH spent four-years without a museum facility so we are so glad to be able to present exhibits again. To add, since opening in our current location, it has allowed this organization to recruit and train more than 10 new volunteers who assist in various capacities including help to conduct the tours of the exhibits. Some of those new volunteers are both high school and college students who receive volunteer credit from their respective schools. Thank you so much for your time. Looking forward to seeing you at MLFH!